What a great event ! My son and I truly had a great time and my volunteer /helpers were phenomenal. This event at fun station surpassed any expectation I could have had; thank you for hosting and please do this again. I have never felt so at ease at a busy outing with my son like I did today. I will be sharing my experience with other parents and encouraging them to participate in your future functions. My daughter was in middle school when I met Andrea through a friend. At that point I had battled unsuccessfully for my daughter to have even the most basic accommodations, like enlarging handouts. I had no hopes of her earning a high school diploma, I was beaten down and dejected. Andrea helped me through one very critical meeting with my daughter’s IEP, she knew what to ask for, what was possible, and she fought for my daughter to have the supports she needed to learn and grow. After that, with such a great plan in place, things improved year after year. Not only did my daughter earn a high school diploma (Port Richmond staff were also fabulous) now she is in college. Andrea is an angel! She and her organization have helped so many children and their families realize brighter futures. Thank you from all of us!!! Andrea is an angel to my family. She is a dedicated and caring advocate, who works tirelessly for all her clients. She has helped me fight the system that puts their budget over the needs of children. Andrea obtained 68 make up sessions of OT for my eldest daughter and helped me sue for proper class placement for my other daughter, who is Autistic. Andrea presented a case worthy of a $10,000 attorney fee. She really is that good. But Andrea is a selfless person who works at very nominal costs. She is a true hero for families with special needs children. I thank God for her. Having a child with special needs is definitely a challenge and unfortunately you find yourself spending a lot of time listening to the advice of many “professionals” who you hope have your child’s best interests at heart. Then you meet someone who actually does. Andrea has worked tirelessly and passionately from the first day we spoke to ensure my son received what was appropriate, what he was entitled to and what he deserved. Her desire to do what is right for a child is so strong that she can’t rest until she accomplishes her goal. It was this desire that had me rethink my son’s school, his goals and his future. I’m happy to say that I believe he’s on the path to a wonderful education and we have Andrea to thank for that. She never underestimated my son’s abilities and never let me do it either. Her knowledge of the special education population, of special education law and of the department of education is beyond compare and I had the utmost trust and faith in her ability to get my son what he needed. Getting to know Andrea first as an advocate and then as a person has been a pleasure. I know the message at the office says, “welcome to our family” but I can honestly say Andrea will always be a part of my family. I cannot express my gratitude enough for all that she and the staff at FHF has done for my son and my family. You have given me a strength and confidence to know that nothing is impossible and everything is worth fighting for! Every child with special needs should have a person like Andrea in their lives. We are forever grateful…..THANK YOU!!!! Andrea is a wonderful person who without her help I would not have received anything my son needed. She guided us through the whole process and knew exactly what my son needed to succeed in school when the school gave us zero guidance. Andrea was a god send to me. My daughter was failing and the school was doing nothing. The standard comment was “were doing all we can.” Andrea attend two IEP meeting and my daughter Amanda is now a condfident 6th grader with no complaints, tears or tantrums. The schools need someone like Andrea who knows her stuff to get them organized. I think they are afraid to recommend the correct course of action. Always worried about the budget. I have the utmost respect for Andrea, her staff, this organization and the work they do for families. My husband and I have attended both the regular support group and the couples support group and we have learned so much from Andrea on how to help our child with homework. She taught us strategies that have helped both I and my husband get more involved in our child’ s education and in turn he gets the support he needs at home as well as in the classroom. Myself, my husband and my 2 kids attended the Hotel Transylvania screening and had a wondeful time. Everything was organized and ran smoothly. It was great to be in a judgement free space for the first time ever. We look forward to attending more FHF events. Thank you for all you work, our family appreciates it. This organization is incredible! I volunteered for the first time at the Fun Station Event on Sept. 26th, 2012. I had a wonderful time with the little girl I spent the morning with. Being only 15, I’m limited to the things I could do to make a difference in world, but that day it felt wonderful to make a little girl with stuggles, happy. To see her smile and enjoy her herself on the rides,and laugh at my jokes as we played games, really had an impact on me and my thoughts on volunteering. I would like to take any opportunities I can to help this organization as well as the parents and children! I cannot wait to go to the next event and hopefully see the girl I volunteered for as well as her supportive parents, and the caring and loving staff at FHF! Andrea helped me with my son’s turning 5 process into kindergarten when I was at my wit’s end. It is because of Andrea’s help and guidance and belief in my son, that he was put into the appropriate district, school and class. I’m pleased to report that he is doing extremely well!! Families Helping Famililes is a wonderful organization that is there for ANY child with special needs. The events that are held are wonderful for both the children as well as the families. The people in charge, such as Andrea Lella, Jenn Parsons and Bernadette are absolutely wonderful. They donate so much time to us and it is so appreciated. Andrea is a wonderful person and thanks so much to her for all of her helpful information on giving us such valuable information to help our children. You really are angels !! Thank God for fhf,such a supportive staff, and andrea is a baracuda. i felt so supported. I am a 15 year old volunteer for Families Helping Families and I have seen first hand the good that this organization does. Although I have only worked at a few events starting this year I have witnessed the importance of the events for the children and also their families. They bring happiness to the kids with special needs as well as their siblings and it gives the parents a time to relax while others help out. I will continue to help out when available for this organization because I think it’s an excellent cause! After a very tumultuous early intervention and CPSE experience, it was time for my daughter to enter Kindergarten. Andrea Lella went to her school and observed her. She talked to her teachers and therapists. She then discussed my options with me. It was not what I wanted to hear, but it was the truth. Then, after 19 days of Kindergarten in a special class for autism spectrum children, the teacher told me that she couldn’t teach my child, and wasn’t going to try. Yes, this sort of thing really does happen. Andrea helped us find a GREAT class with and even better teacher and a wonderful, supportive, understanding staff. They were able to teach my daughter, and she is truly flourishing, all because of Andrea Lella. I honestly don’t know what I would have done without FHF. My husband and I cannot express the appreciation we have for FHF and Andrea Lella for all of her guidance and advocacy for our son. She has been the only person that has truly helped us and provided clarity on what our son’s needs are. She works selflessly and truly cares about the child. FHF has also provided us with the support we need and helpful information on how to help with our child’s homework and to help him to compensate for his deficits so that he can grow to reach his full potential. My life changed for the better when I met Andrea and everyone from Families Helping Families. They helped me get the right placement for my son and taught me strategies that work with him. They all know first hand what I am going through, because they go through it too. I am so happy to have found them. I have been fortunate enough to have the services of Andrea since my child has been in the school system. He is now a Senior in High School. I have had nothing but positive experiences with regards to results wherever Andrea is concerned. I have been in meetings where she has taken over, and the DOE has sat up alittle straighter in anticipation of what was next! She has never, ever let me or my son down. I could never have navigated the many ins and outs of the system without her expertise, knowledge and insight. I would not hesitate to recommend her. I am so thankful and fortunate that I have access to the most knowledgeable advocate, Andrea Lella and her team at FHF. FHF shows their compassion for helping children by successfully fighting for their rights, providing them with entertainment opportunities and providing parents with a community to discuss our issues with eachother and in workshops so we can be better prepared and educated in the parenting of our children. I have a daughter who was diagnosed with Down Syndrome and a son who was diagnosed with Aspergers Syndrome. FHF has been a great source of support in advocating for them to ensure they are getting the services needed to be successful students. We continue to appreciate events such as New Year’s Eve Eve party, end of school year party, etc. It feels great to feel warmly welcomed into the FHF family. FHF is an amazing group composed of people who REALLY CARE and UNDERSTAND what special needs children need.Their advocacy services helped my son on the autism spectrum into a 12 month program so he would not regress over the summer. Their events are geared directly toward our kids and every child has a blast at them. There are always volunteers to help so parents can sit and watch their kids have fun. Their recreational events have exposed our children to soccer, basketball and karate. This is great for a child like mine, who just cannot compete in team sports. FHF opens the world to our children and has shown me as a parent that anything is possible. Thank you to everyone at FHF for all you do to help our children. You have made such a difference in my son’s life and YOU ARE AN INVALUABLE RESOURCE!!!!! FHF is such a wonderful organization that has provided our family with support,knowledge,strength, and a lot of fun. We were struggling with securing services for our autistic daughter for well over a year. After reaching out to Andrea & FHF we were able to obtain the services needed. We learned so much along the way about the system. We even became stronger advocates for our daughter thanks to the nudges we received from FHF. This past year during the month of February I called FHF and spoke with a woman regarding SE services. She gave me guidance and offered to represent my child if needed. After that I was able to approach my child’s school feeling justified and with the proper information I needed to get the SE services that was so desperately needed. It took a few meetings but my child received extra help and made progress. The appreciation I feel for your organization cannot be expressed with words. Your associate was helpful, understanding and most importantly knowledgeable. I have since referred FHF to every parent who confides their experiences with me as a valuable resource for parents. Being in foster care was difficult, because what child doesn’t want to be with their mother or father? Growing up with a generation that’s older then your parents, adds another dimension to your life. You get raised very differently. As a child I misbehaved, didn’t care for school and rarely listened to rules, but I am the young man that I am today because my grandmother and great grandparents were hard on me and gave me good advice about school, work and life in itself. This taught me to overcome the obstacle of having been in foster care. What is one thing I can do to make my world better? There is a lot, but the one thing that pops into my mind is work with an organization that helps families with children that have disabilities, called ‘Families Helping Families.’ I first volunteered at the Hilton for a New Years’ Eve party for community service hours. I had the time of my life; there isn’t anything better in the world then to see a child, disability, or not, having fun, running around and interacting with other children. I really grew close to this little boy named John and a couple of others, but John stood out the most. I remember when it was time to see who won the raffle baskets and John won at least four or five baskets. He ran to me and said “Matt, look! I won five toys!” and right then and there, a kid that I hardly knew made me the happiest guy ever. I know I will volunteer with this organization as long as I can because being involved with them makes me proud. When I get older and have a steady job, my major goal is to donate money to ‘Families Helping Families,’ to make sure I am still involved and to give back to the children and their families. I want to have every child have anything they ever wanted; as long as they’re happy it makes me happy. I had wonderful mentors in my life, so I want to be a mentor to all types of children. I want to make sure they’re off the streets and let them know that education is the key of success. You can be whatever it is you want to be. People ask me, “How come you won’t teach children?.” That’s not what I want to do as a career, but I will help children and help any family that needs it, because I was helped as a child and I have worked with kids in after school programs. That’s my main goal and that will make my world better just by being there for children in need. As a society, we should all open our eyes and take a break from work at least once per year to help children or anyone for that matter with disabilities. Help endangered animals or travel. There are a lot of amazing things and a lot of amazing people to see in the world and we should cherish all of this while it’s still here. I just wanted to say what a wonderful job FHF did this year at the New Years party. The children were so happy and comfortable . The parents were allowed to sit and not have to worry because there were so many wonderful volunteers who were very enthusiastic to work with our children. The DJ was so wonderful with our children you could see the enthusiasm on their faces as he guided them through games and dancing. The smiles from our children lit up the room and when you can sit back and take that all in, there is no better feeling. Amazing job ladies! You really make our children enjoy things in a way they deserve to. the new year’s eve eve party was the highlight of the christmas break for me and my son michael. He ate 2 hotdog, a first, he sat and received a cars face paint by a talented young artist and posed with me for a picture. Last year he would not leave the hallway of the knights of columbus hall this year he thoroughly enjoyed himself. We are grateful to andrea, jennifer and all the volunteers for this wonderful event. I am not sure if this is considered a testimonial or an astute observation, but I wanted to share it with everyone… I have known Andrea Lella for about 6 years. She has advocated diligently, tirelessly and expertly for my two children. And her efforts have been evident in my children’s successes. And in all those many years that Andrea has advocated for us, I always felt that she and I had this special connection with her and that she loved my children like part of her own family. Don’t get me wrong, I always knew Andrea has hundreds of “clients” besides my children just by the huge numbers of parents that attended all of her workshops and meetings, but I always felt that our family was special to her. I felt that way because she always treated us that way, like we were very special to her and that she loved as as part of her family. This year, my two children became involved with her Special Olympics Soccer league. In this program, there must have been about 150 other children that participated too. Each week we went, I watched Andrea as she ran from field to field, supervising her volunteers and providing behavioral support to the kids. I watched how she interacted with all of “her” kids. I watched how they all hugged her and called to her when they made a goal. I watched how she interacted with all of the parents and how she remembered things like if their mother was sick, or if they found a new job or how their new boyfriend was working out. I watched her as she made it her business to spread herself thin but completely around the tremendous space encompassing our program’s four field spread to have personal contact with EVERYONE. I listened to how the other parents spoke about Andrea and how their children spoke about her… and then I realized it… Everyone of them felt like they had a special connection with Andrea. Everyone of them felt as if she were their dear friend. Everyone of them felt as if Andrea loved THEIR children as if they were part of her family. That’s when it became clear to me. To Andrea, we are ALL special. To her, they are ALL “her” kids and a part of her family. Up until today, I used to thank God everyday for putting Andrea Lella into our lives, but from now on end, I will have to readjust my prayers. I will now be thanking God everyday for creating such a loving, passionate, dedicated and selfless woman like her and giving her to the entire world, not just us! Hi, I just wanted to thank you all for the wonderfully comprehensive calender of events that you posted. My children had a great time at both of the Parks department programs listed. I am also glad that your site offers so many resources and helpful links. It makes it easy when I have a question to just go to your site and look it up. The ask the advocate message board also makes getting questions answered quickly easy. Please keep up the good work! Its about time there was a group like yours on Staten Island! Dear Andrea, I want to thank you for all that you do. I first met you about 4 years ago at a wonderful special education work shop that you did. I learned more in that evening than I did in the 10 years that my child was in special ed. Thank you so much for agreeing to take on my case and thank you for getting my child placed in the right program, with the right services and the right goals. If it weren’t for you my child would still be stuck in the wrong program and not making progress. I also want to thank you for all the wonderful events that you hold. The Family Fun trip to Medieval Times last fall was great and so was the circus trip this spring and the theater trip this summer. We especially love the soccer program that is running right now and we are very excited that the Homework Help program will be getting started soon. I am also hoping that you will be holding another special education workshop soon too. May God bless you because he certainly blessed us when he led you into our lives! Thank you so much for your great soccer program! My son is having a fantastic time. For the first time ever, my son feels like he belongs to something more than just a school program or a therapy schedule. On the way home today he chatted for 20 minutes about his new friends, the game, the goal he scored and how much fun he had. I don’t how I can ever thank you for providing such a wonderful program. The thing that amazes me the most is the wide range of kids, ages and functioning levels your program serves. To my counting, there appeared to be 10 teams of all different ages and functioning levels. I guess it’s all possible because of the dozens and dozens of volunteers that you have. They are very obvious with their bright green vests on and they pop up exactly when they are needed. You are ALL wonderful and we are so glad that we found you!!! We can’t wait until your Homework Help program gets started, keep us posted and THANKS again! Thank you Andrea for helping me get my daughter in a CTT with a Para and out of the 12:1 she was in. I never could have done it without you! After my second meeting without you went south, it was blessing that you came into our lives like some sort of hero in a book to fix it all. You gave us so much of your time, between meeting to review my daughters documents, writing the hearing request, going to the resolution meeting, preparing for the hearing with me and actually dong the hearing, you invested well over 100 hours to my daughter’s case and you did all that while you juggled a dozen other clients at the same time. You always made me feel like my daughter and I were special to you. The really good news is that your hard work paid off because we just got her progress report and she is getting great reviews and grade in all of her subjects! We can never thank you enough for all that you did! Thank you so much for the FANTASTIC soccer league that you are running! I have too children with special needs; my daughter who is learning disabled and a little immature (she is in the CTT), and my son who is autistic and in a 6:1:1. I never imagined that I could find a GREAT recreation program that would meet BOTH of their needs!!! We have been having such a great time and it is SO WONDERFUL for me to just sit back and watch as the wonderful volunteers do everything! My daughter is happy because she has made many new friends and has finally found something that is JUST right for her, not TOO low functioning and not TOO athletically and competitively orientated; and my son is delighted and doing GREAT too! He absolutely LOVES his 1:1 shadow, which I might add were plentiful and liberally given out, and he lights up and claps and squeals with joy as he we pull up to the field each week!!! Thank you SO MUCH from all of us who have been waiting for years for a FREE, APPROPRIATE and DIVERSE recreational program for ALL of our children! My son needed a private special education school. My wife and I tried everything and this was our last resort. Andrea fought our district to recommend this placement. She then went to the impartial hearing with us. I didn’t realize that ANdrea could act as a lawyer as well. We won our case. She has done this each for us and has won each time. Lawyers charged $5000 for these services. Andrea did it free. She won’t take any pay for her services, but I hope she will take our undying gratitude. I struggled with having my disabled son in a special class in a non home zoned school, while having my non disabled son in the home zoned school. I asked the DOE several times if I can get a variance for my other son to be in a school that was closer to my other son’s school. I was told that I cannot get a variance for a non disabled child. Then I asked Andrea. She told me that if one child has to be placed in a different zone, a variance will be granted to the other child to make thier proximity easier for the parent. I applied for the variance and I got it. Only Andrea told me this. I would like to say that my daughter and I had been very satified with FHF activities they have accomplished so much for our children. And as I look at very kids face they seem so happy and excited that alone makes me feel so good inside. My daughters enjoy meeting new kids and playing all kinds of games with them. I also want to say that Andrea Lella is a great advocate she has helped me through my rough time selecting and transitioning schools for my daughter. I thank her so much because my daughter is very happy with her new school and is doing much better. I am so glad i met Andrea Lella. She has taught me so much through her workshops and is continually a wealth of information when needed. She is always there for me when I am dealing with the school, and going to IEP meetings for my son and daughter, who both have special needs. She has opened my eyes to understanding my childrens rights. We are so lucky to have someone who is so knowledgeable and passionate about what she does. She truly cares about the children and wants to help every one of them. I am amazed at how she recalls all the children she works for, and there are alot of them. That is how you know she really cares. The activites she has planned are wonderful. My kids have had such good times in a comfortable and safe enviorment. We look foward many more events. 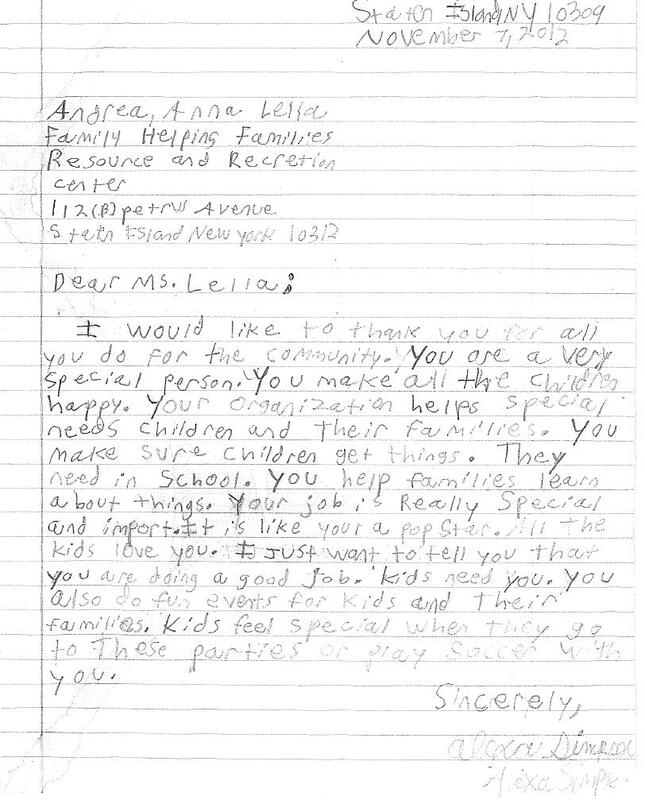 Andrea Lella is truly a special person who gives so much of herself. Thank you so much for all you do. I just wanted to say how amazing it was to watch all the kids play basketball at Fast Break on Thursday. We are so tired of hearing our kids “can’t” from teachers …doctors….evaluators…etc. when we KNOW our children CAN and WILL. This event was a clear example of that. Our children were determined as they warmed up, did relays, shot baskets, dribbled, transitioned with ease from one activity to the next…participated as teams (big and small) and all in the presence of almost 50 kids. They were all cheers and smiles!!! We know our children want to belong….and they clearly get to feel that each time we have events such as these. Hats off to Andrea, Jenn, the Parent Board and Coach Mosley for helping our children feel the normalcy they so deserve! Andrea Lella is an exceptional person who extends herself to families who are seeking the best for their special needs child but bound by what they are told is the only answer for their situation. There are many options for children now and gaining access to what is right for them is an exhausting maze which many cannot face alone. If there is one person who can step up to the bureaucracy, challenge the wording so a lay person can understand and obtain what their special needs child really needs and deserves, it is Ms. Lella. She lights up my day when she enters my building as I know another lucky child will have a chance. 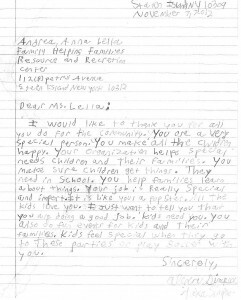 People like Ms. Lella barely exist in this world (as I know from personal circumstances.) Staten Island parents are fortunate to have her to turn to. I spent two years with my son in a school and in a class where I heard DAILY he can’t. Andrea helped us get my son into a new program in a new school and NOW the teachers are seeing exactly what both Andrea and I knew from the beginning of our fight….HE CAN AND HE WILL. My son is a different boy! He loves school…he loves his teachers and he has friends. Thank you Andrea!!!! Jeremy, our precious gift from God, was born with a bilateral hearing loss. It has been a difficult journey, but God chose us because he felt we were special. He never left us alone to endeavor this task. Many angels were sent along the way to help us. While some were soft spoken, others were more aggressive. However, the most vivacious one was Andrea Lella. She uses every ounce of energy to SAVE CHILDREN. Without her Jeremy would be working with unqualified therapists simply due to budget cuts. Finally, he would be sitting in an air conditioned recreational room today watching his friends enjoy the pool at camp simply because he must remove his cochlear implants while swimming. (Jeremy is totally deaf without his implants). A six year old boy should not be held responsible for securing such an expensive device. MOST IMPORTANTLY, MY CHILD NEEDS TO BE KEPT SAFE IN A SWIMMING POOL. Thankfully, Andrea as usual, marched in and recited the law at a resolution meeting. A Para was provided and Jeremy is swimming now with his peers at camp. I can’t stop smiling today. THANK YOU Andrea!!!!! !